? Rose sales increase: Which is good news for those of us who enjoy pink wine. Sales increased about 50 percent in 2007, according to a Nielsen study. Why did this happen? A couple of reasons, I think. Consumers are beginning to understand that rose is not the same as white zinfandel, and offers value for money — especially in the $10 range. Also, producers are making better wine, particularly in California.
? Wine sales in a recession? Tom Wark at the Fermentation wine blog may have found a relationship between wine sales and economic downturns. This is something wine people talk about a lot: How much of a luxury product is wine, and will consumers give it up when times get tough? 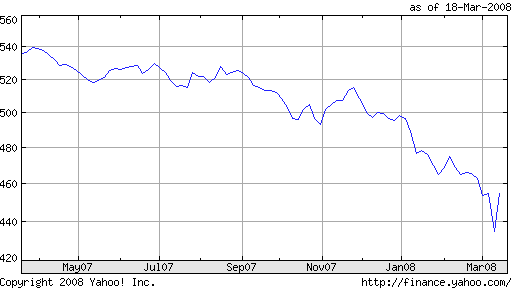 Wark tracked wine club sales, and there seem to be a cancellations that are following the on-coming recession. “I have no doubt that were it being done for the past 15 years we’d see that at this moment that Index will be in a severe downward trend,” he says.
? Blog awards: And while you’re at Fermentation, take a moment to vote for Alfonso Cevola, whose On the Wine Trail in Italy has been nominated for two American Wine Blog awards. Alfonso not only knows more about Italian wine that almost anyone I know, but he is always incredibly kind and generous with his time. Especially when he is dealing with the Wine Curmudgeon, and we know how difficult that can be. I wrote about this in November, when the dollar was at record and near record lows against the Australian dollar, the euro and several other key foreign wine currencies. And things have only gotten worse since. It’s a great value, actually. The Oak Leaf label, produced by The Wine Group, is the retailing giant’s house brand. As noted a couple of weeks ago, it has scored quite a few successes in respected wine competitions. The Wine Curmudgeon was skeptical, of course — not only because that is his nature, but because he is skeptical of all things Wal-Mart. One of the rules of this business is that one should only write about wines that are locally available. After all, what’s the point in waxing poetic about a wine that no one can buy? Which brings us to the Neprica, a sample of which arrived this week and which I tasted immediately. That’s because it’s a $10 Italian red blend from Tormaresca, a very reliable producer that understands how to combine quality and value. In fact, this wine is so good that I’m going to break the availability rule. Since I just got the sample, the wine probably isn’t in most stores yet. Never mind. Go to your local retailer and tell them to order some. The Neprica is made with a local grape called negroamaro, plus primitivo and cabernet sauvignon. It’s darker in flavor than chianti, but it’s still low in alcohol and it’s not aged in oak. The latter gives it a fresher favor. I drank this with spaghetti and tomato sauce with mushrooms, and my only regret was that I didn’t have another bottle.
? Wine as an investment: What’s the point of drinking wine when you can invest in it? None, actually, but that hasn’t stopped people with entirely too much money from treating wine as if it was real estate. In 2007, reports Reuters, the main British stock index rose by less than four percent. The main index on Liv-ex, where fine wine is traded, ended the year up 40 percent. At the risk of sounding much too curmudgeonly, let me say two two things: First, wine is not an asset like a house or shopping center, but an intangible with no intrinsic value. It is made to be drunk, not traded like soybeans. Second, those who do not know history are doomed to repeat it — see the 17th century Dutch tulip bubble.
? More wine company buyouts: The Wine Group, which already owns Big House, Glen Ellen, and Mogen David (among many others), has bought the Almaden and Inglenook brands from Constellation Brands. The transaction makes the Wine Group California’s second- and the world’s third-largest wine producer by volume. Almaden and Inglenook, though not much more than jug wine brands now, were once some of the most prestigious labels in the country. Their purchase solidifies the Wine Group’s hold on its share of the largest portion of the U.S. market — wines that cost from $3 to $9 a bottle.
? More from Champagne? The French are expanding the area in the Champagne wine region, so that more sparkling wine can be labeled champagne. The government will redraw the 1927 boundaries for the region (what the French call an AOC or appellation d’origine contr l e) to include up to 40 villages. The motive? Increased international demand for bubbly, which can only be called champagne if it’s from the champagne region of France. Quality shouldn’t suffer, though, since many of the villages that will be added didn’t want to be included when the boundaries were drawn 80 years ago. The French, who once supplied the world with quality cheap wine, have been mostly supplanted by the Australians and the Chileans over the past decade. This has caused not just consternation within the French wine industry, but serious financial difficulty. Some producers, realizing the crisis, have made significant changes to their products. They use better quality grapes, have upgraded their production techniques, and have adjusted their pricing to compete with $7 bottles of Yellow Tail. They understand that consumers will not pay a 10 or 20 percent premium because the wine label has some French on it. Case in point is the Les Jamelles, one of the finest $10 sauvignon blancs — one of the finest sauvignon blancs at any price — that the Wine Curmudgeon has tasted in a long while. This is French sauvignon blanc the way it used to be — cheap, tasty and complete. There’s hardly any citrus, because Les Jamelles understands that French wine is not supposed to taste like New Zealand wine. It does have some tropical flavor, mostly pineapple, as well as the minerality that French sauvignon blancs are supposed to have. Drink this, chilled, on its own, or with seafood, salads or grilled chicken. South Africa, I’m told by people who should know these things, has the right climate and the right soils to make quality wine. It’s supposed to be one of the next great regions for sauvignon blanc. But its wines still do not have the best reputation. One reason is that the country’s national grape, pinotage, is an acquired taste. Another is that its modern industry dates only to the end of apartheid, and it’s difficult to accomplish much in the wine business in just a couple of decades.